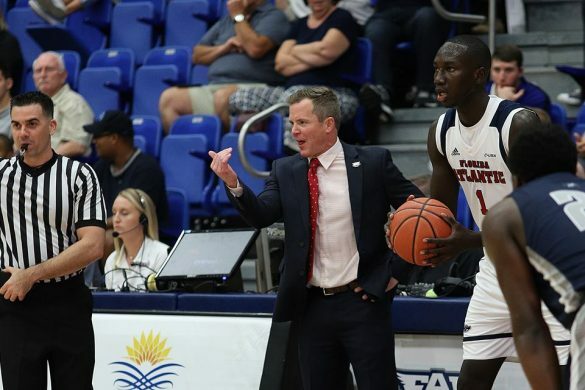 BOCA RATON – FAU didn’t need drama to complete its sweep of Florida International. After consecutive walk-off wins to begin the series, the Owls nearly mercy ruled the Panthers in a 10-1 victory on Sunday. 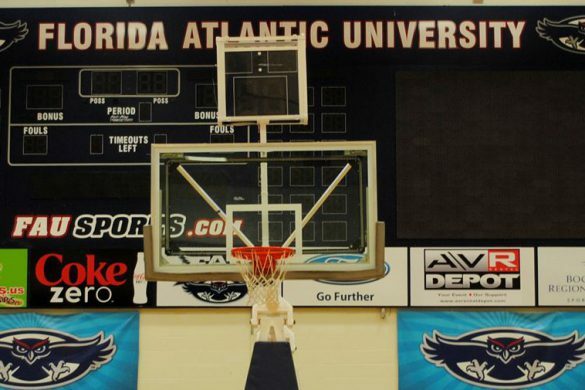 “It was a really, really good weekend against a good team,” FAU coach John McCormack said. 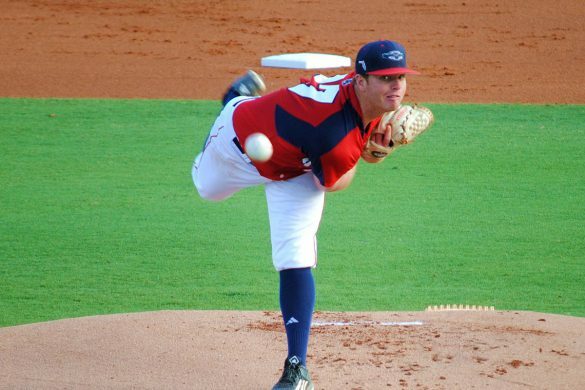 FAU starter Jake Miednik delivered arguably his best outing of the season, allowing one run on four hits in eight strong innings. He only found himself in trouble once. With two outs in fourth, FIU loaded the bases on two singles and a walk, then scored its lone run when Miednick hit Nick Day with a pitch. Miednik recovered to strike out Adam Sevario to end the threat. “I didn’t really care about velocity or strikeouts or any of that – just whatever pitch was called, just try to make the best pitch possible,” said Miednik, whose record improved to 5-4 on the season. FIU’s lead didn’t last long. Saturday’s hero, Jared Shouppe, blasted a three-run homer to right in the bottom of the inning to give FAU a lead it wouldn’t relinquish. 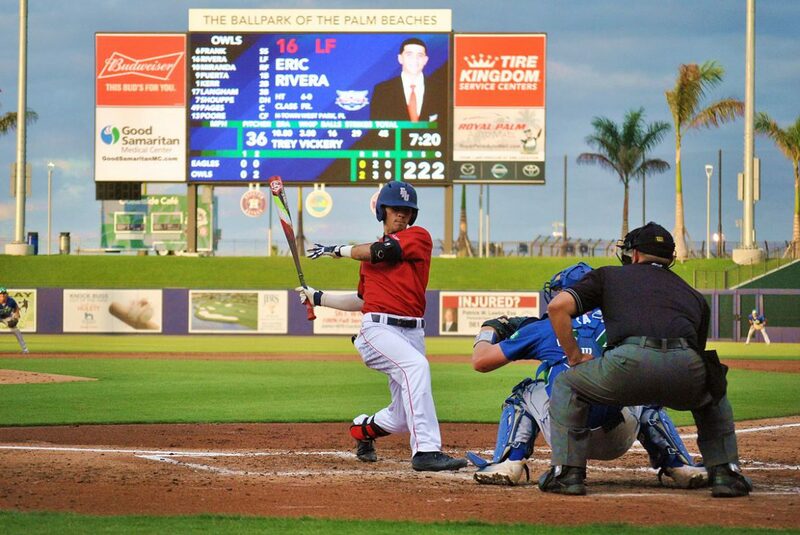 Eric Rivera boosted FAU’s lead to 5-1 with a two-run blast that defied a strong incoming wind and cleared the left field wall. 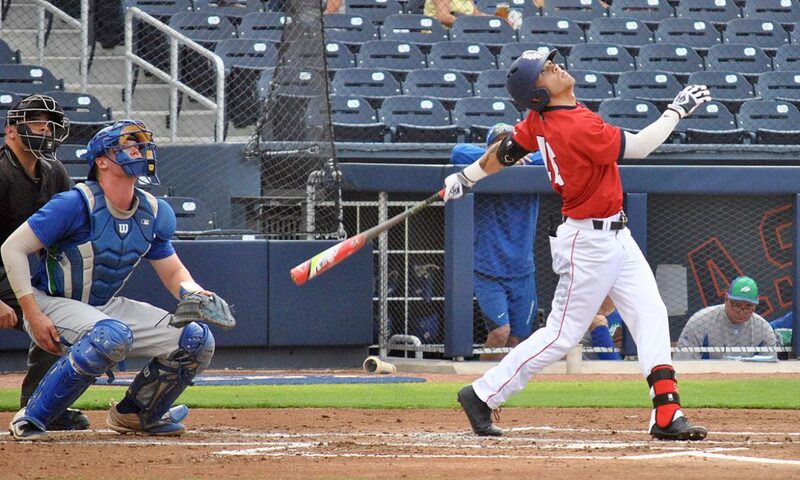 David Miranda added a solo shot to start what would become a five-run eighth inning that salted the game away for FAU. Moving Forward: With three hits on Sunday, Shouppe finished the FIU series 6-for-11 with five RBI and four runs scored. 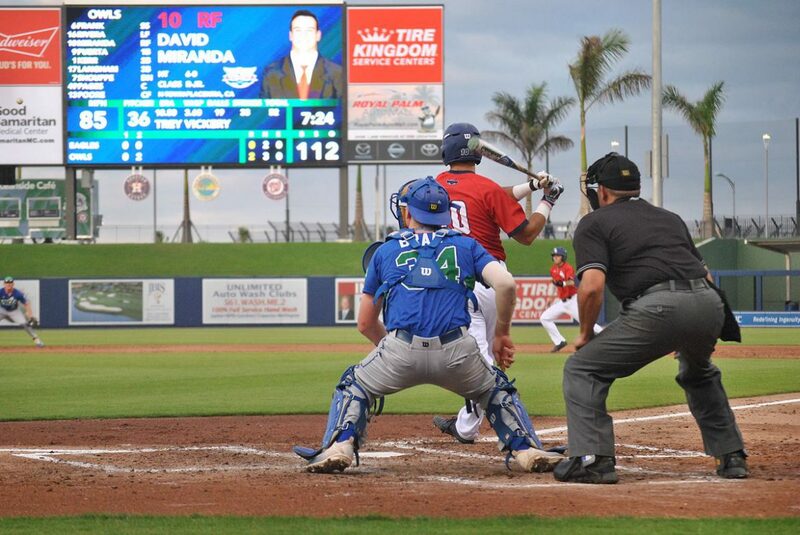 …David Miranda scored five runs over the weekend, hit a home run on Sunday and scored the game-winning run on Friday. …Jordan Poore went 2-for-3 on Sunday. …Miednik struck out seven while walking only two. 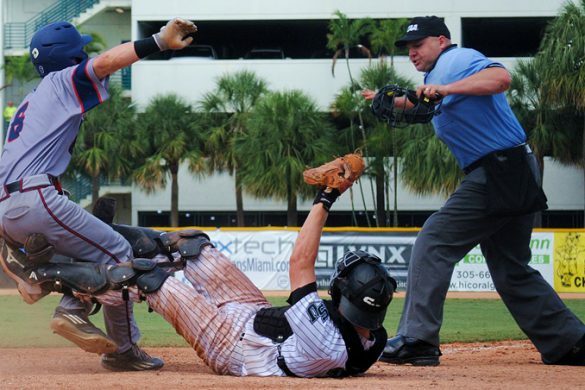 Sliding Backward: Esteban Puerta went hitless in four at-bats and committed an error. Key Stat: 1 – error committed by FAU all weekend. That error, charged when Puerta failed to handle a one-hopper, came with two outs in the top of the ninth on Sunday. 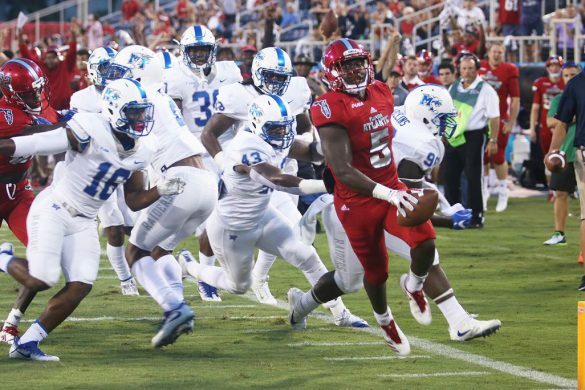 Up Next: FAU travels to Mississippi for a showdown with Conference USA leader Southern Miss. 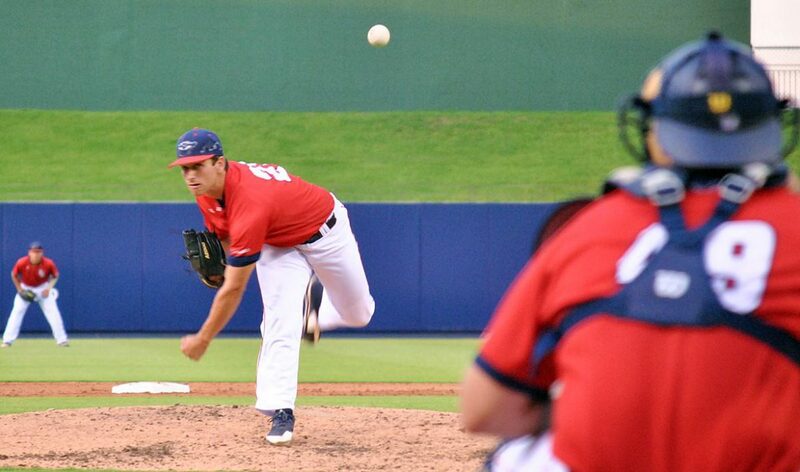 First pitch on Friday is scheduled for 7 p.m.
VIDEO: Saints draft FAU DE Hendrickson in 3rd Rd. UPDATE: Defensive tackle Shalom Ogbonda has received an invite to the New York Jets mini camp. Former Owls Brandin Bryant and Randell Johnson are currently with the Jets. The NFL Draft had been over long enough, and Tyler Cameron’s phone had been silent long enough that he began considering playing other sports as a hobby. “I was looking up old-men’s basketball and softball leagues to join in those 45 minutes,” Cameron said. Finally, the former FAU tight end received the call from agent James Paul that he’d been waiting for. The Baltimore Ravens invited Cameron to participate in their upcoming mini-camp. 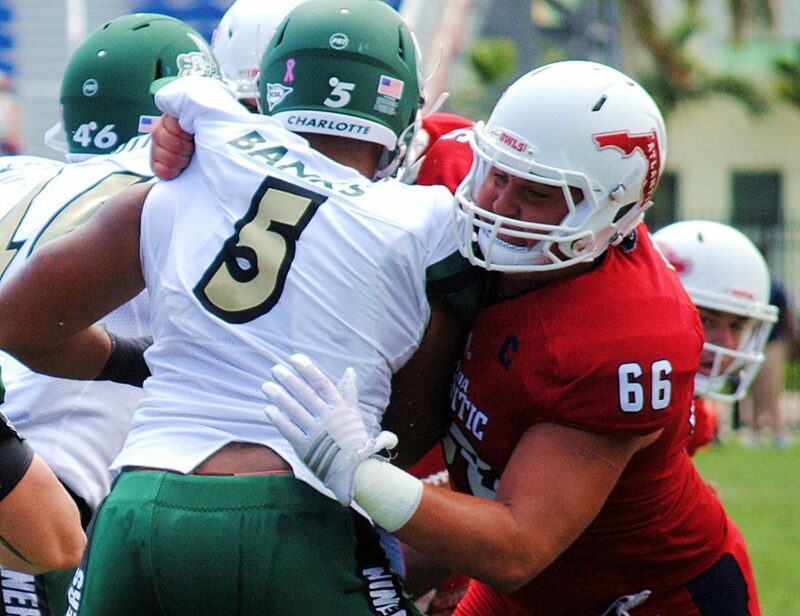 On Friday defensive end Trey Hendrickson became the seventh former player in FAU to be drafted when New Orleans selected him late in the third round. No other Owls heard their names called on Saturday as the draft concluded. Shortly thereafter, though, offensive lineman Dillon DeBoer agreed to sign with the Los Angeles Chargers. Then Cameron received his phone call. “My agent told me that a few other teams were interested but he didn’t want to wait and thought the Ravens were my best opportunity,” Cameron said. A quarterback at Wake Forest before transferring to FAU and converting to tight end for his final two seasons, Cameron caught 20 passes for 252 yards and a TD as a senior. 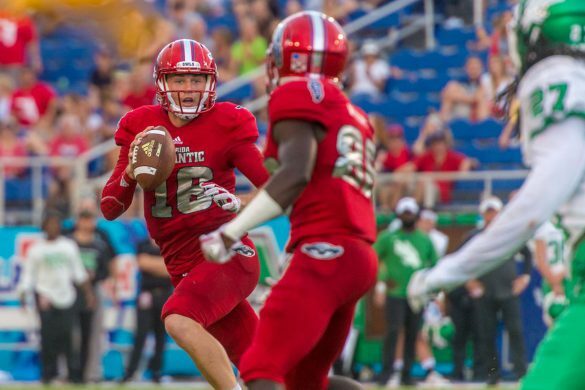 Interest in Cameron prior to the draft was nearly non-existent until he impressed scouts with his athleticism and strength during FAU’s pro day in late march. Only two tight ends at the NFL Scouting Combine managed more than the 22 reps of 225 pounds Cameron bench pressed that day. The Ravens were one of a handful of teams who liked Cameron, who weighed in at 6-foot-3 and 232 pounds on pro day, as a tight end-fullback hybrid. “They’ve kind of been in the lead for the past week, interest wise,” Cameron said. Punter Dalton Schomp and defensive tackle Shalom Ogbonda could still sign a free agent contract or accept an invite to an NFL team’s mini-camp. 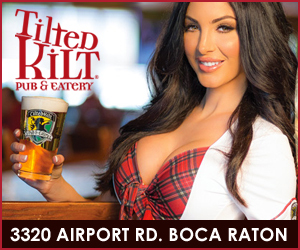 DELRAY BEACH – What does a former National Championship offensive coordinator do on a Saturday in South Florida? 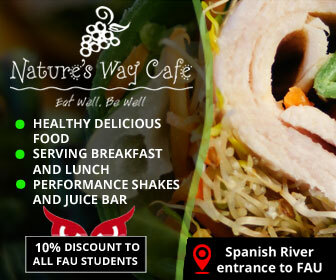 If you’re new FAU head football coach Lane Kiffin, you scoop ice cream. One week removed from his first FAU spring game, Kiffin spent part of Saturday afternoon in Delray Beach as one of several guest scoopers at Ben and Jerry’s on Atlantic Avenue. Team dentist Dr. Richard Staller and his South Florida Advanced Dentistry crew were some of the organizers for the event which benefited the P -4 Foundation and the Anthony Rizzo Family Foundation. Anthony Rizzo is the first baseman for the World Champion Chicago Cubs. His brother, John Rizzo, was a key member of those first FAU football teams. The goal for the day? To Freeze Out Cancer. Kiffin scooped ice cream, drizzled on sauces, applied toppings and handed out the orders. He even attempted to learn the cash register. So did all of Kiffin’s football experience give him something to draw upon as an ice cream scooper? Kiffin won’t be seeking a career at Ben and Jerry’s any time soon, but he does feel events like this are important for him as a coach. “For us to help out with a great cause like this is great,” Kiffin said. 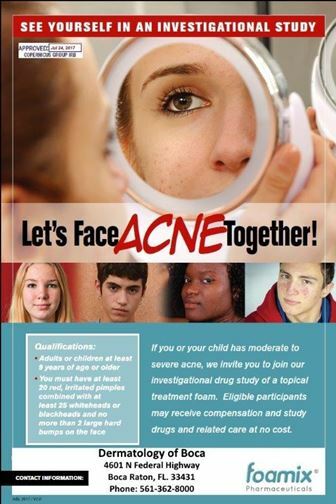 To Donate to the cause, visit P4 Foundation.org or the GoFundMe page set up specifically for this event. 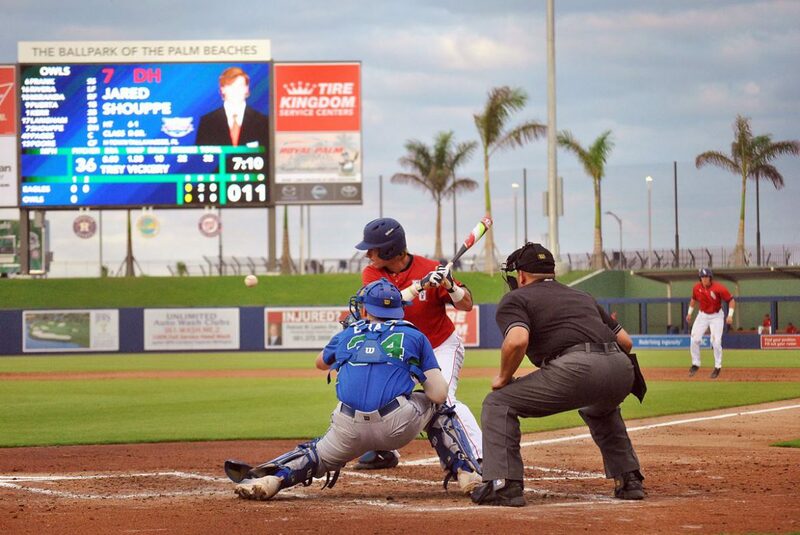 BOCA RATON — As they did on Friday night, FAU defeated FIU in walk-off fashion – this time with a 9-8 victory in 10 innings thanks to Jared Shouppe’s game-ending RBI line drive down the right field line. The Owls entered the weekend series without a walk-off win all season. 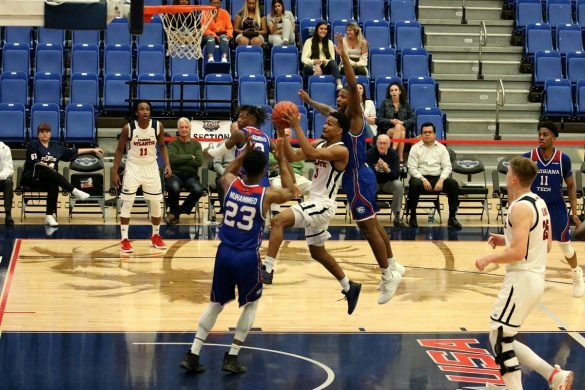 “These guys make fun of me because later in the year, I call them ‘senior moments’ and this was when we need a senior moment,” McCormack explained after his team’s fourth straight win. No one needed a senior moment more than Sean Lasban, who tied the game at 8-8 with a pinch-hit two-run home run in the bottom of the ninth inning. 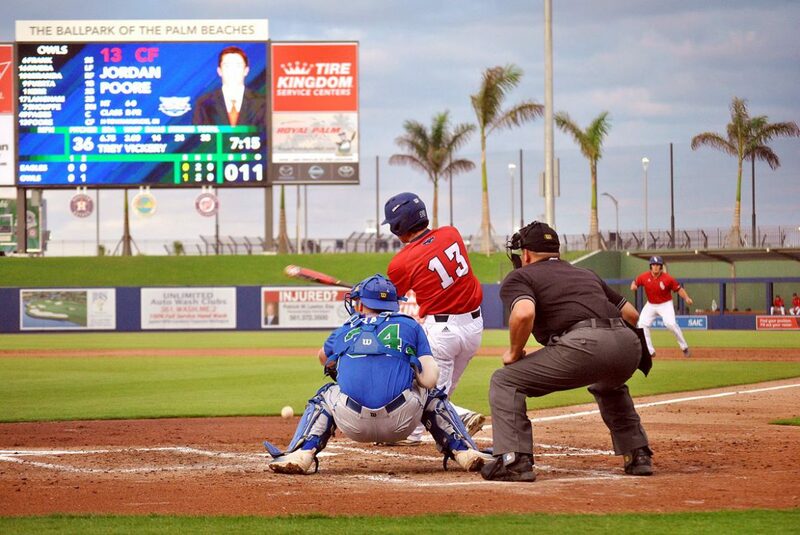 With FAU down to their last out, Labsan – hitting in place of Pedro Pages – snuck an 0-1 pitch from Chandler Raiden over the right field wall. 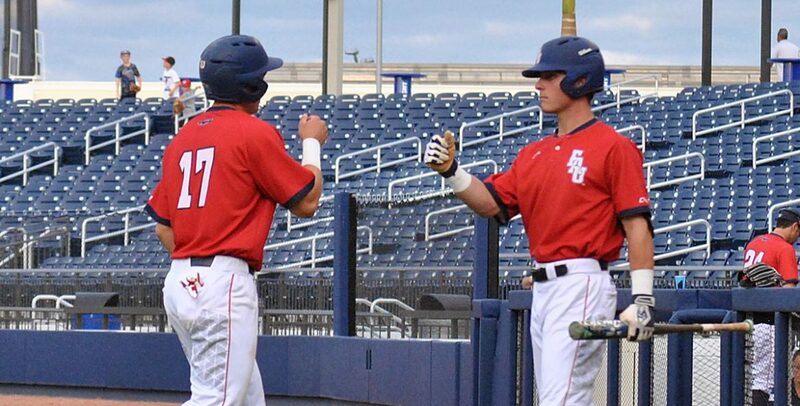 Labsan’s home run was FAU’s only long bomb on the day, but it couldn’t have come at a better time – both for him and the team. 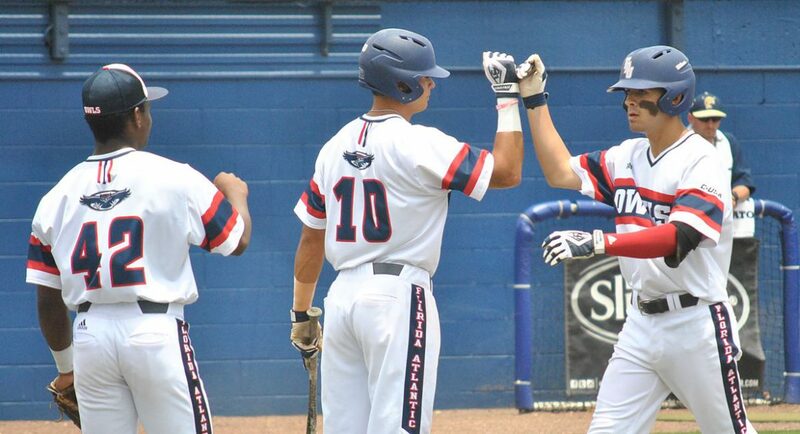 Labsan wasn’t the only senior to shine on Saturday, as Austin Langham gave the Owls their first lead of the game with a bases-clearing double in the bottom of the seventh inning. Down 3-1 after four innings, FAU slowly clawed back, with Esteban Puerta and Shouppe each recording RBI singles during the fifth inning. Two innings later, Langham reached base in the bottom of the ninth inning with a single to left field to set up Labsan’s home run. As for Shouppe, his second ‘senior moment’ came an inning later, when he took a 2-1 pitch down the right field line to score David Miranda and send the FAU fans home happy. Shouppe was award a double on the play, although video appears to show he never reached second base. 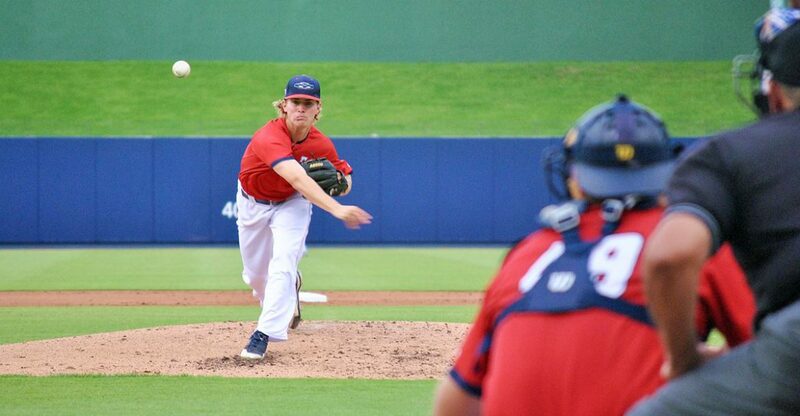 Moving Forward: Eight of FAU’s starters had a hit…Tyler Frank was 4-5 and walked, one of six total walks for the Owls….Kyle Marman, Blake Sanderson, Drew Peden, Weston Clemente, and Cameron Ragsdale combined to allow one hit in 2.2 innings of relief. 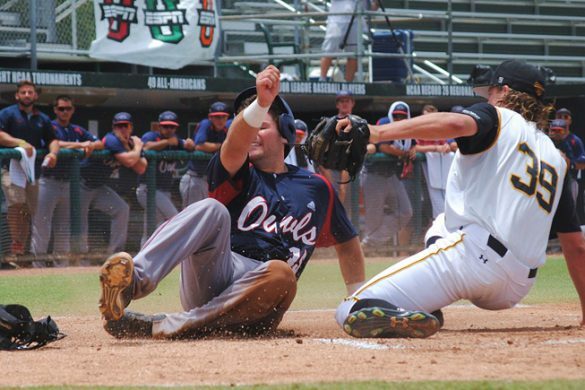 Sliding Backward: Stephen Kerr was the lone Owls starter to not record a hit…. Mark Nowatnick wasn’t great in his second start of the year, allowing four earned runs in 4 1/3 innings. …Nick Swan relieved the junior and threw three innings, allowing the 6-4 lead to become a 6-6 tie in the top of the eighth. Key Stat: 17 – hits for the Owls on Saturday. Up Next: FAU will go for the sweep against their in-state rivals on Sunday when Jake Miednik will take the mound on an extra day of rest. First pitch is set for noon. 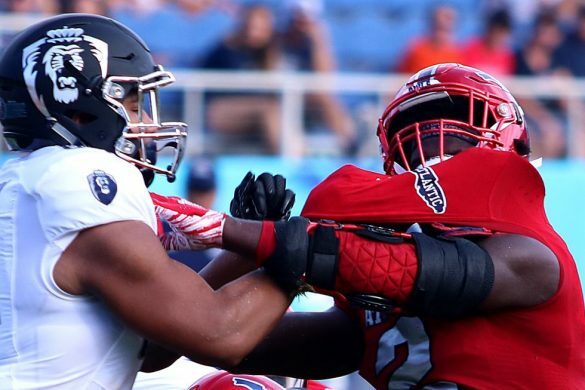 Former FAU defensive end experienced a delayed reaction when representatives from the New Orleans Saints called to tell him he was about to get drafted. He needed to hear his name on the draft telecast to finally be sure of what happened. Hendrickson became the first FAU defensive end ever selected in the NFL draft when Saints chose him with the 39th pick of the third round – 103rd overall. That makes Hendrickson the third-highest FAU player ever selected in the draft, behind CB D’Joun Smith (Rd. 3, Pick 1 – overall 65, Indianapolis) in 2015 and TE Rob Housler (Rd. 3, Pick 5 – 69 overall, Arizona) in 2011. 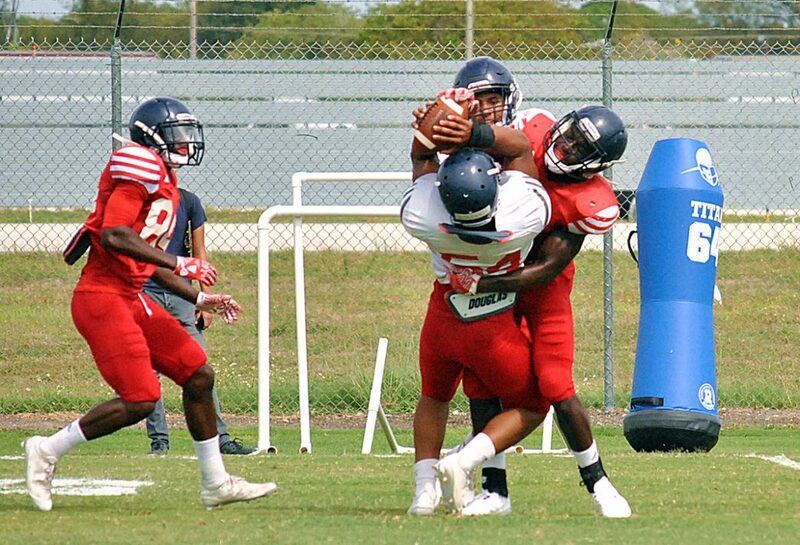 A relentless pass rusher, Hendrickson left FAU as the Owls’ career sack leader with 29. He also set the program’s single-season record with 13 in 2015. As a team, New Orleans managed only 30 sacks in 2016. Only five NFL teams had fewer. Defensive end Cameron Jordan led the way with 7.5. The Saints were one of about 10 teams that brought Hendrickson in for a pre-draft workout. Hendrickson said the Saints were impressed with his work ethic. “They want to mold me into being the best Saint I can be,” Hendrickson said. Conference USA named Hendrickson its Defensive Player of the Year following the 2016 season. He earned an invite to the NFL Scouting Combine as well as the East-West Shrine Game, where Hendrickson was selected as the Defensive Most Outstanding Player. Hendrickson recorded 9.5 sacks as a senior, fighting double and triple teams on nearly every snap. FAU also used him as a blocker on short yardage and goal line plays. A standout special teams player, Hendrickson tied for the lead nationally in blocked kicks with four. The Saints call to Hendrickson, who is currently in the Orlando area with his family, came shortly after 11 p.m.
On Friday night wasn’t exactly planning to celebrate by making a short drive to Disney World. 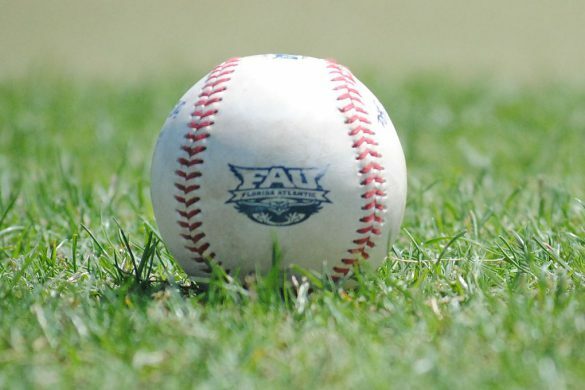 BOCA RATON – FAU didn’t put the ball in play even once during the ninth inning but still scored a walk-off 4-3 victory over rival FIU. David Miranda began the inning by getting hit in the helmet by a pitch. He advanced to second on a wild pitch and to third on another. Following Esteban Puerta’s walk, Miranda raced home on yet another wild pitch with the winning run. With the wind blowing out to right, FIU victimized FAU starter Alex House for a couple of home runs. JC Escarra started the scoring with a deep fly ball in the first inning that barely cleared the right field fence. With the Owls leading 2-1 in the fourth, Zach Files launched a no-doubt two-run homer to right that gave the lead back to FIU. House allowed three hits and a walk while striking out two in 7 2/3 innings. With the game tied 1-1 in the third, FAU threatened to break the game open when the Owls loaded the bases with no one out. 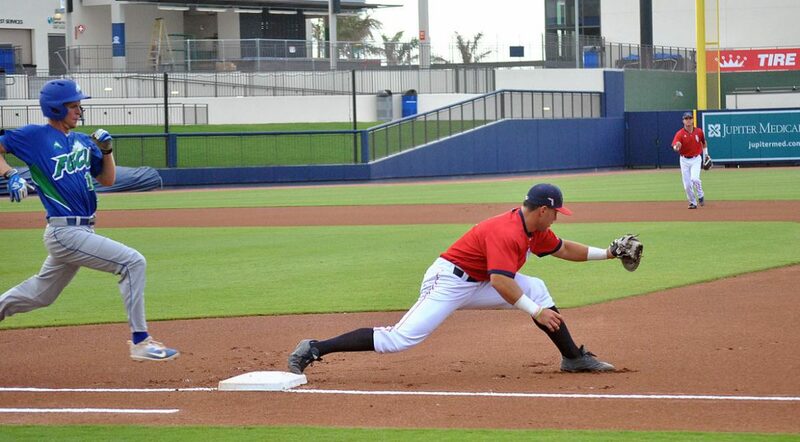 FAU, though, only managed to plate one, that coming on a Stephen Kerr sacrifice fly. Miranda set up his own heroics by tying the game at 3 in the seventh with a solo homer over the bullpen tree house. Moving Forward: Kevin Abraham enjoyed the first three-hit game of his career and drove in the Owls’ first run. …Esteban Puerta went 3-for-4 with a run scored. 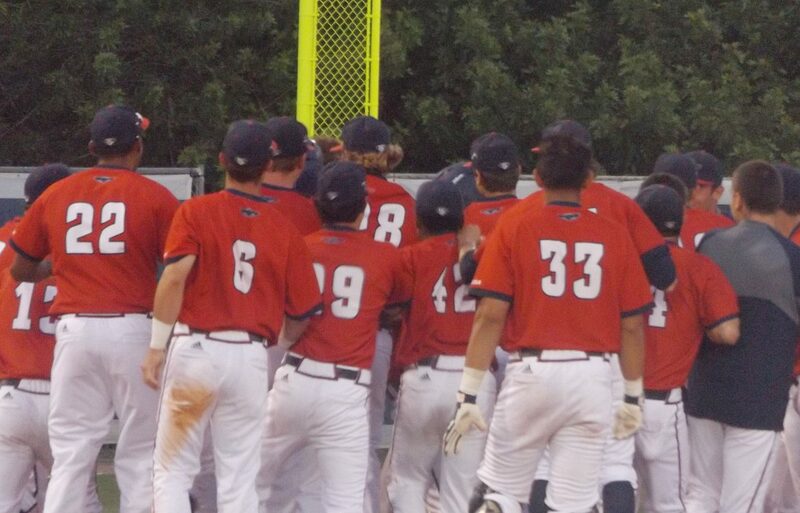 …Reliever Drew Peden allowed a single and hit a batter, putting two on with one out in the ninth, then struck out the next two batters to set up the walk-off. With the win Peden improved to 4-0 on the season. Sliding Backward: Centerfielder Jordan Poore when hitless in four at-bats, striking out twice. He did make some nice defensive plays in left field, through. 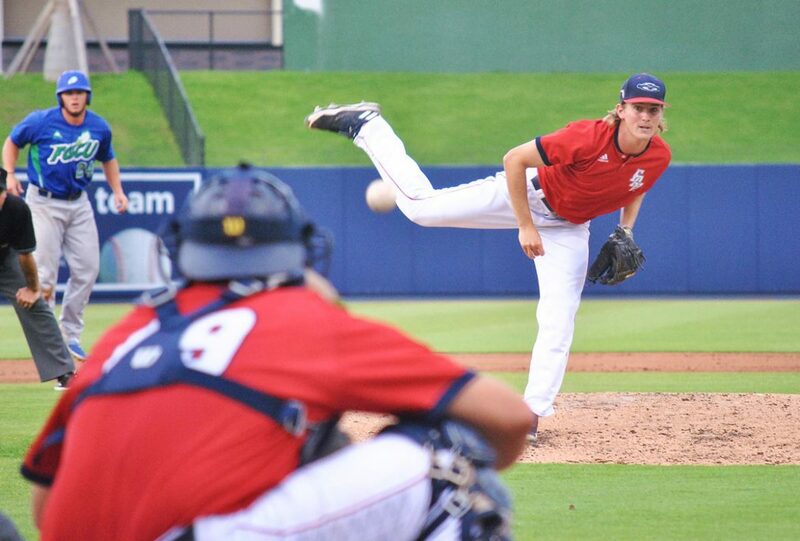 …Austin Langham went 0-for-3, drawing a walk. Key Stat: 4 – hits allowed by FAU pitching. Up Next: FAU and FIU play the middle game of their weekend series on Saturday. First pitch is scheduled for 4 p.m.
Trey Hendrickson spent the past four seasons feasting on Conference USA quarterbacks. Now he’s ready for dessert. 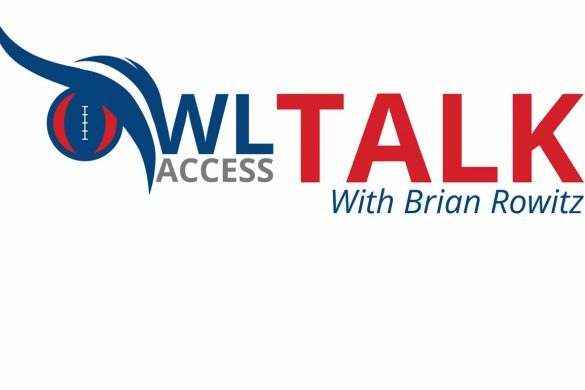 Since Hendrickson, the FAU career sacks leader, last took the field as an Owl in December, he focused on preparing for the 2017 NFL Draft, which begins today with the first round only and runs through Saturday. The finishing touches included – the frosting – on his NFL resume came during these last few months at the NFL Scouting Combine and workouts for individual teams. NFL draftniks seem to think the latest layer of icing improved Hendrickson’s cake. Hendrickson so impressed during the January all-star game in St. Petersburg that the Shrine Game named the defensive end its Most Outstanding Defensive Player. His quickness became the subject of many a tweet from the Combine. 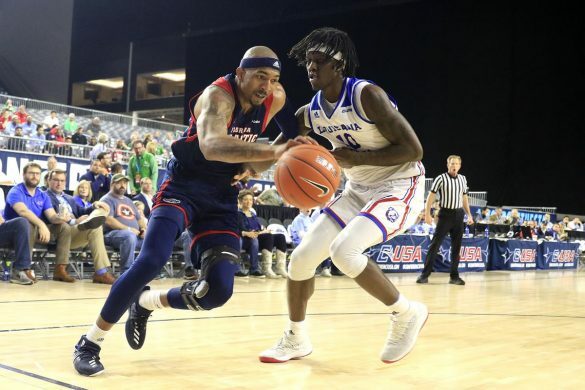 Those workouts may have helped Conference USA’s Defensive Player of the Year climb into the second day of the draft. The consensus among NFL draft prognosticators is that Hendrickson will be selected in the third round, which is the final round on Friday, or when the draft resumes on Saturday with the fourth. If Hendrickson has an idea which team will be his new favorite team, he isn’t saying. He estimates that about 10 different NFL teams worked him out individually or brought him to their headquarters for a visit. Hendrickson says those teams asked him not to reveal their identity and he is complying with their requests. If the draft breaks his way, Hendrickson could surpass D’Joun Smith as the highest drafted player produced by FAU. Indianapolis selected Smith with the first pick of the third round in 2015. Hendrickson will likely be the only former FAU player drafted this year, but several others have a chance to extend their football careers as undrafted free agents. Dillon DeBoer moved from tackle to center for his senior season at FAU, but he says many teams have shown interest in moving him to guard. “They can bring me in and shuffle me around if they want,” DeBoer said. Defensive tackle Shalom Ogbonda participated in the local team workouts for Miami and Houston, and says that between five and 10 teams have shown some level of interest. He’s confident some team will give him a shot. “I’ve heard talk about late round but it’s mostly more undrafted [free agent],” Ogbonda said. Since the season ended Tyler Cameron added long snapping to his repertoire. 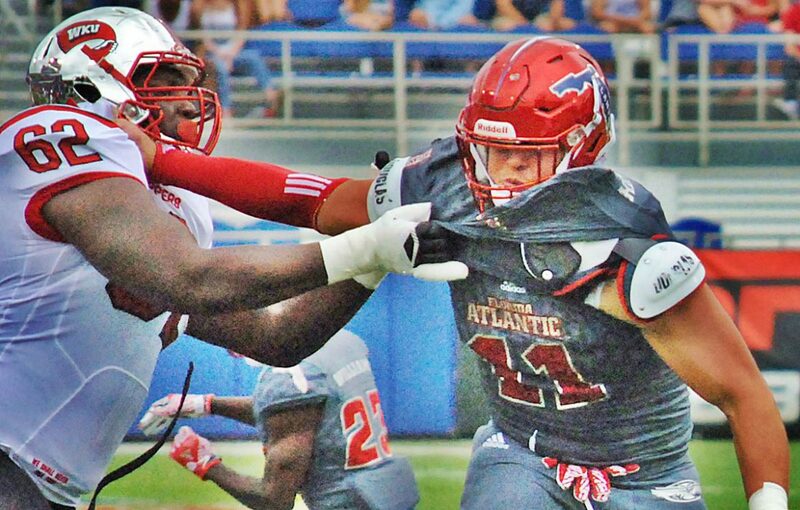 The athleticism he showed during FAU’s Pro Day piqued some teams interest in his ability to play a hybrid tight end/fullback role. And then there’s Dalton Schomp, who led the nation in punting as a junior. Last year his average yards per punt dropped in large part because he didn’t have Ryan Rickel around to handle pooch punting duties. Schomp showed off his booming leg at a specialist camp in Arizona and says that “five or six” teams are showing interest. Few teams, however, spend a draft pick on a punter, and most teams only carry one punter on their active roster, so there aren’t many openings. 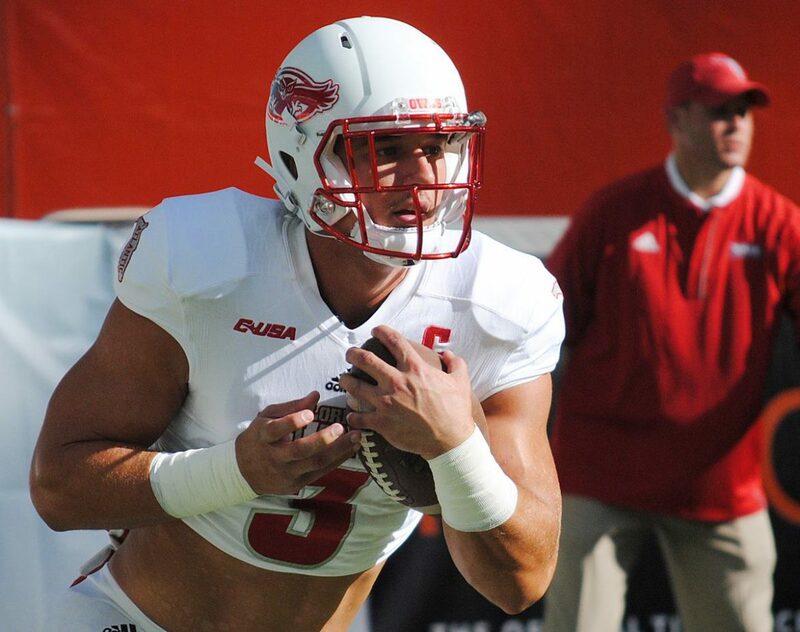 No FAU player helped their chances of playing professional football at FAU’s pro day more than tight end Tyler Cameron. In the coming days he’ll learn whether he did enough to get one team – any team – to take a chance on him. “Hopefully I created a bit of a market for myself,” Cameron said. It sounds like Cameron might have done exactly that. Cameron believed that if he could get the attention of scouts, he could convince them he was an NFL-caliber player. Prior to FAU’s pro day, the Denver Broncos were the lone team to reach out to Cameron. Afterward? Ten teams, including Cleveland, Buffalo, Detroit, Miami and Jacksonville have shown interest. It’s easy to understand why scouts were slow to move on Cameron. He played quarterback at Wake Forest before transferring to FAU, where he converted to tight end. Last season, as a senior, the undersized Cameron didn’t show the kind of production that would make more than a ripple in the NFL’s draft pond. With the Owls struggling in the passing game, Cameron spent most of his time as a blocker. His 20 catches for 252 yards and a touchdown didn’t land Cameron on any watch lists, though he did have the fourth-most catches on the team. His pro day results didn’t exactly scream “can’t miss,” either. At 6-foot-3, 232-pounds Cameron was about 20 pounds heavier than his senior-year playing weight. He was disappointed with his 4.72-second time in the 40-yard dash, expecting to run something closer to 6.6. But he did bench press 225 pounds 22 times – only two tight ends at the NFL’s Scouting Combine did more. He ran crisp routes and displayed good hands. Scouts picked up on his athleticism, with some figuring he might be a fit in the hybrid tight end-fullback spot many NFL teams now employ. “The have their big prototype tight ends and they have their speedier tight ends on the outside to create mismatches,” Cameron said. Cameron wants NFL scouts to see him as a grinder. He’s even learned to be a long snapper, adding to his versatility. “That will bring a little value to me,” Cameron said. Cameron remains a long shot to make an NFL team. He won’t hear his name called on Thursday when the NFL holds the first round of its 2017 draft. Friday, when rounds two and three take place, will pass quietly, too. In all likelihood Saturday’s final rounds will also count away without teams taking a chance on Cameron. It won’t be until after that final round concludes that Cameron may have a choice to make. He’ll be free to sign with any team. The question then becomes, Will the phone ring? “I just want to get my shot,” Cameron said. BOCA RATON – With the offensive review completed earlier in the week, it’s time to grade the FAU defense. As a unit, assigning grades the defense proved much more difficult than their offensive counterparts. The Owls played the spring game with five potential starters sidelined because of injuries. Still, the rules say everyone gets a report card (if there are such rules – which there probably are somewhere on the internet. We’re guessing it’s on Snapchat. 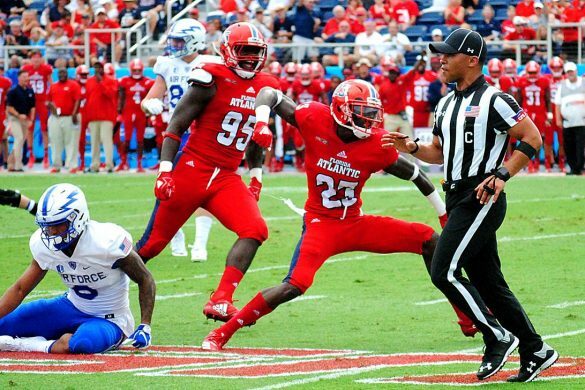 ), so here’s the spring semester report card for the FAU’s defense. DEFENSIVE LINE: C. No one said replacing Trey Hendrickson was going to be easy. FAU did manage a pass rush against a beat-up offensive line on Saturday, which is the main reason they graded higher than the O-line. Still, there are concerns about the pass rush and the ability to stuff the run. Like coach Lane Kiffin said earlier this spring, if you can’t stop the run up the middle, you don’t have to worry about a pass rush because teams will never have to throw. Player to Watch: Ray Ellis. The redshirt junior defensive tackle missed all of last season and the spring after tearing his ACL during fall camp. His return should bolster the middle of the line. LINEBACKERS: Incomplete. The grade is a bit of a cop out but, really, how could anyone reliably grade this unit? FAU was so shorthanded that it abandoned the base 4-3 to play a 4-2-5 in large part because it required fewer linebackers. Starting middle linebacker Nate Ozdemir left the team. Azeez Al-Shaair and Khantrell Burden missed all of spring, but should return for fall. Kris Harris was a pleasant surprise in the middle for much of the spring, but missed the spring game. On Saturday, a true freshman walk-on and a redshirt freshman walk-on converted from tight end were both on the two-deep. When fall camp begins, this unit should look much different. Player to Watch: Hosea Barnwell. 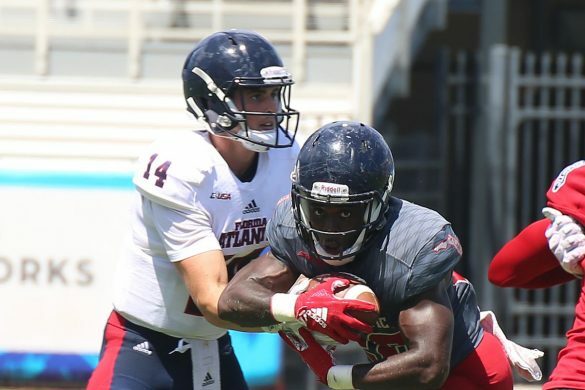 The Owls think they found something in the walk-on redshirt freshman, who ended the spring as the starting middle linebacker. 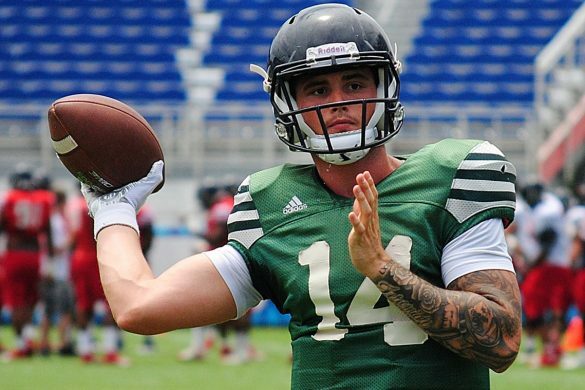 Will he push the veterans and junior college transfer Carson Lydon once fall camp begins? Bonus: Jacob Douglas started three games last season but was non-factor for most of the spring. Can he return to relevance? CORNERBACKS: B. With the lack of depth at linebackers, this unit became even more important. 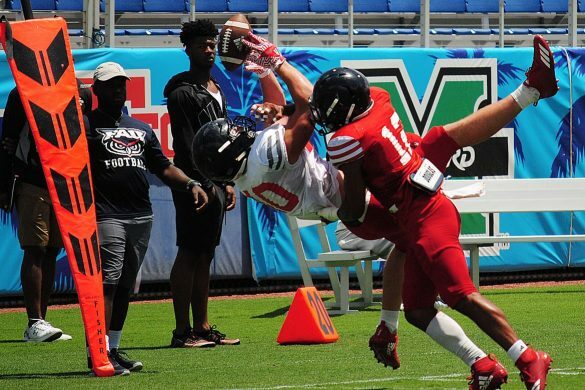 After a slow start in which they consistently surrendered big plays to the offense during practices, the cornerback play improved dramatically. Moving Herb Miller to nickel was a big help. 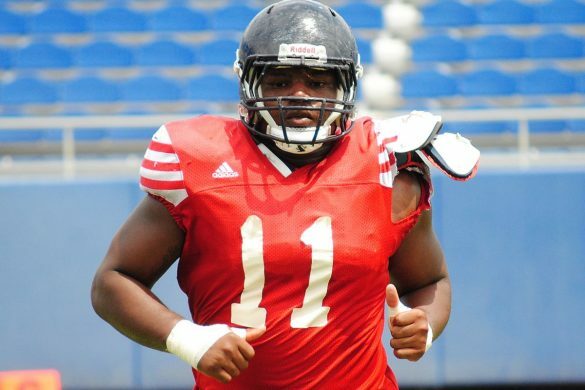 Raekwon Williams could be in for a lockdown senior year, and there is depth here. Shelton Lewis and Chris Tooley have game experience and redshirt freshman Korel Smith enjoyed a strong spring. Player to Watch: Quran Hafiz. The true freshman who enrolled in January ended spring as the backup nickel, allowing coaches to experiment with Ocie Rose at safety. Hafiz could see significant time early this season. SAFETIES: C. The back line cut down on the explosive plays, but they still happened too frequently. Jalen Young is a tackling machine on the field, but his physical style leads to injuries like the separated shoulder that kept him out of the spring game. Rose and Andrew Soroh comprised the first team safeties on Saturday. Walk-on Jordan Helm and Jake Stoshak were behind them. There’s surprising little depth here. Player to Watch: Rose. He’s physically gifted, but has struggled to be in the right position during his first two seasons. Rose admitted he was going through the motions early in spring but turned up the focus with the move to safety. Is this Rose’s true position, or will he move back to nickel? And can he be a factor at either spot? 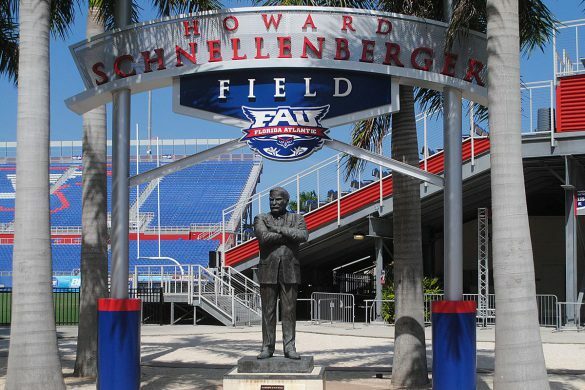 WEST PALM BEACH – Florida Atlantic may want to consider making its new home-away-from-home its primary residence. 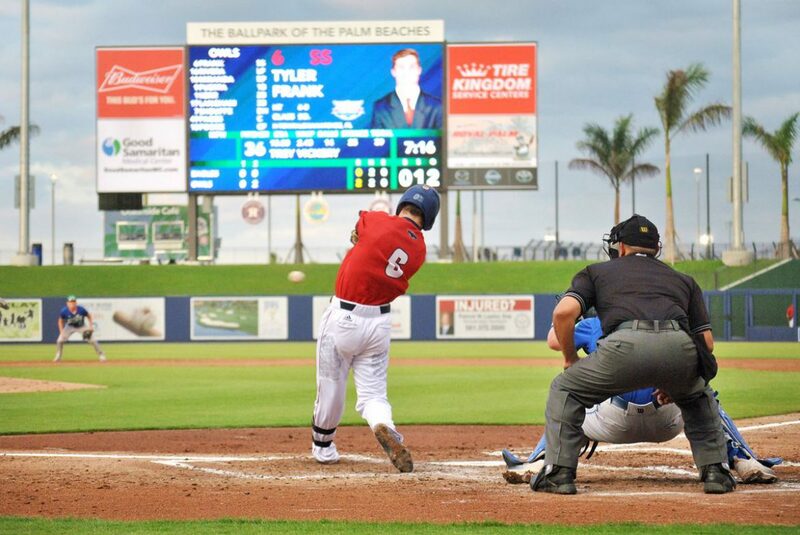 Playing their first game in the brand new Ballpark of the Palm Beaches, the Owls bludgeoned Florida Gulf Coast 13-1 on Tuesday. 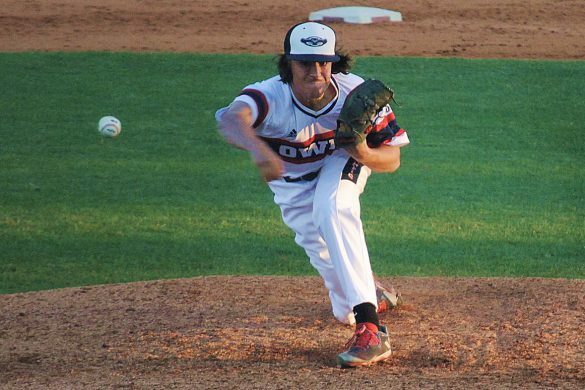 Four different Owls enjoyed multi-hit games and eight pitchers combined to shut down the Eagles at the plate. 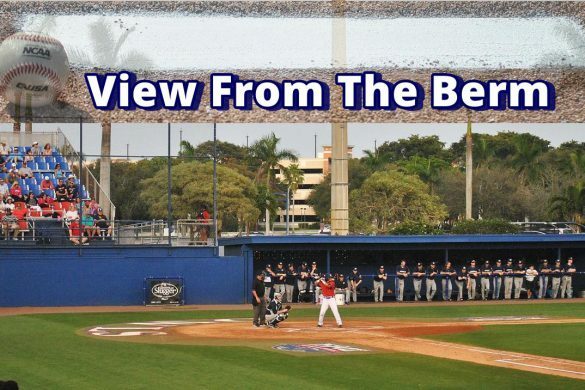 FAU achieved a modicum of revenge with the victory, having lost to FGCU 7-5 on Feb. 28. Spring training home of the Washington Nationals and the Houston Astros, the Ballpark of the Palm Beaches opened in February. 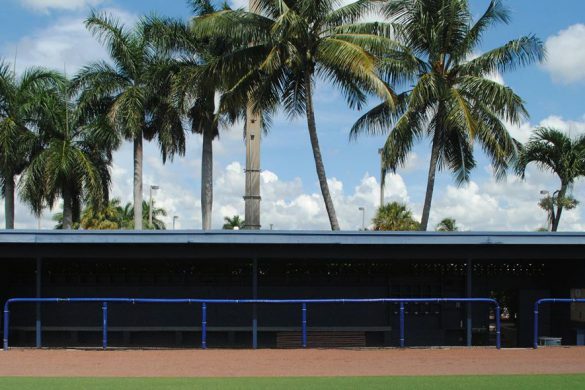 Unlike Jupiter’s Roger Dean Stadium, the spring training home of the Miami Marlins and St. Louis Cardinals, neither the Astros or the Nationals have a minor league team that calls the ballpark home, so it’s been virtually unused since the end of March. 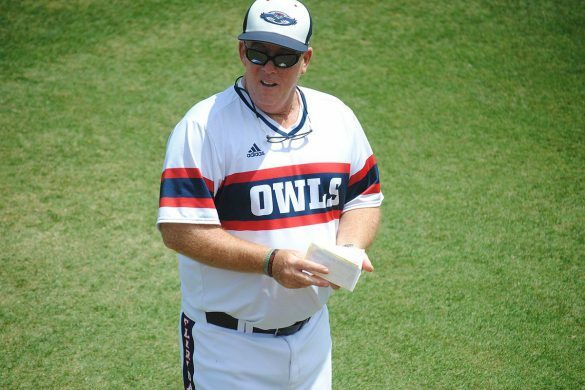 The Owls elected to move their final two midweek games of the season to the Ballpark of the Palm Beaches in hopes of starting a relationship that could pay dividends in future postseasons. 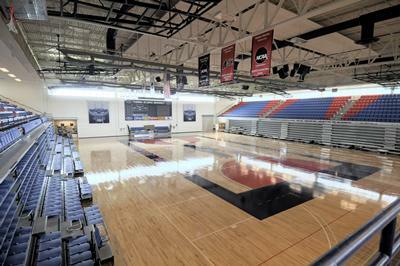 FAU’s outdated on-campus facility doesn’t meet the standards to host either a Conference USA tournament or an NCAA regional. While it’s likely too late for the Owls to play a postseason game here this season (the C-USA Tournament will be played at Southern Miss and FAU doesn’t have the resume to warrant consideration as an NCAA Regional host), the Ballpark of the Palm Beaches could become a viable host site in the coming years. 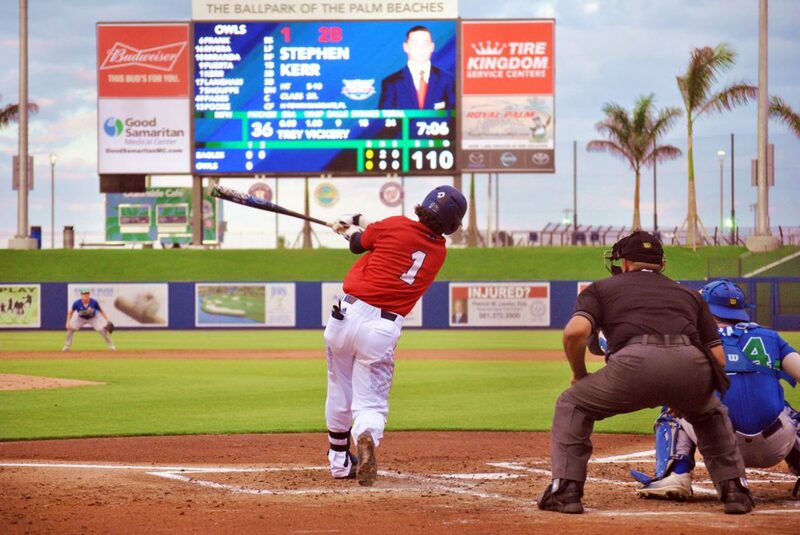 On Tuesday, in front of a sparse crowd, FAU smacked line drive after line drive that echoed throughout the venue that holds more than 8,000 fans when full. David Miranda’s two-run single highlighted a five-run second inning that saw the Owls send 10 men to the plate. One inning later Miranda launched a bases-loaded triple to deep right-center field that cleared the bases, capping a four-run. 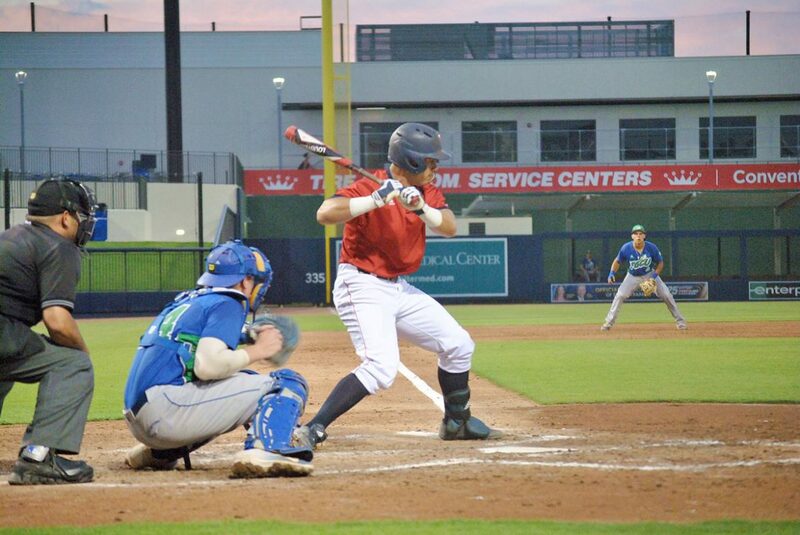 Esteban Puerta pounded a Matt Rumpf offering onto the berm beyond the left field wall for a fifth-inning grand slam that ensured the Owls would bus back to Boca with a victory. 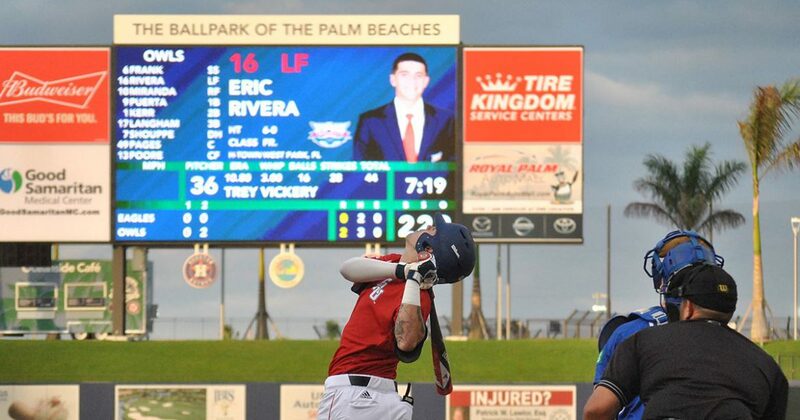 While FAU hitters found their power strokes, the Owls’ pitchers overpowered the Eagles’ bats. 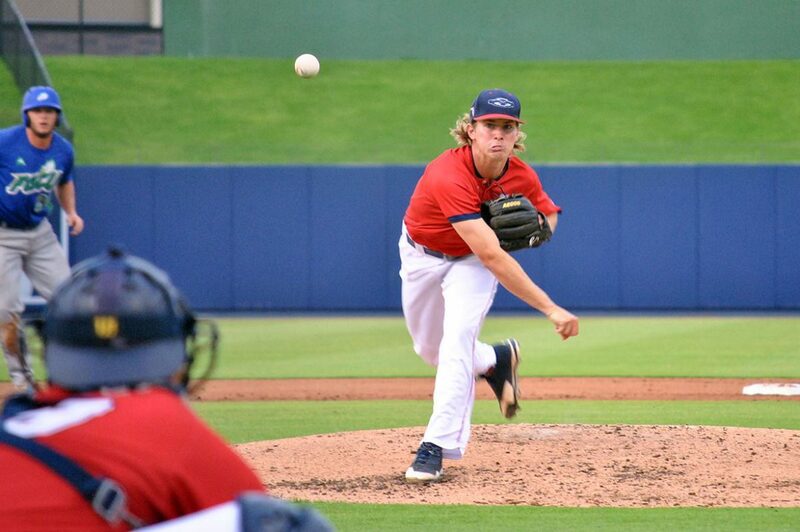 Making his first start of the season, Blake Sanderson tossed two scoreless innings, allowing two hits and striking out two. Sanderson, who boasted a 1.50 ERA entering the game, could be heading to the weekend rotation, joining fellow former reliever Mark Nowatnick there. Nowatnick tossed five shutout innings to earn the win over Texas-San Antonio on Sunday in his first start of the season. Seven different relievers followed Sanderson on Tuesday, each throwing an inning. Only Kyle Marman surrendered a run – a solo homer in the ninth. 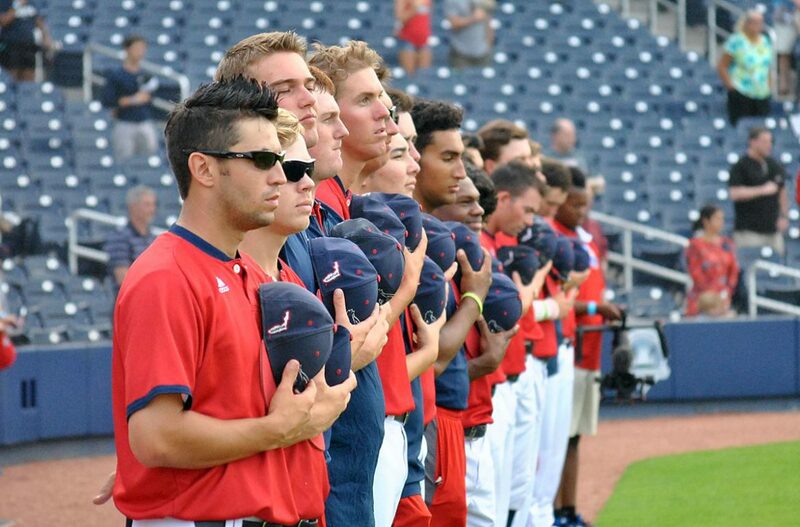 FAU will return to the Ballpark of the Palm Beaches on May 16 to face Central Florida. 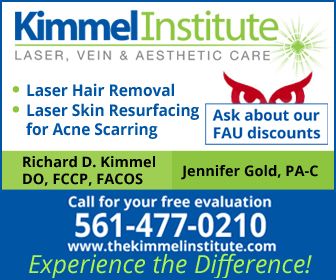 Moving Forward: FAU Baseball hit a home run with this game. 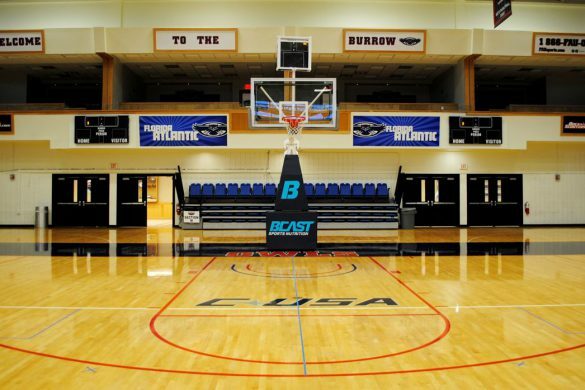 Great venue and the Owls played well. 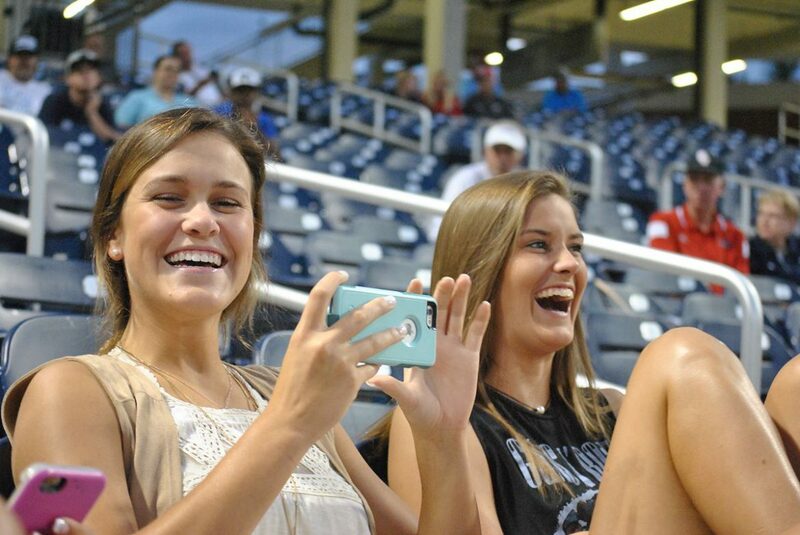 Fans should be looking forward to the May 16 game against Central Florida. 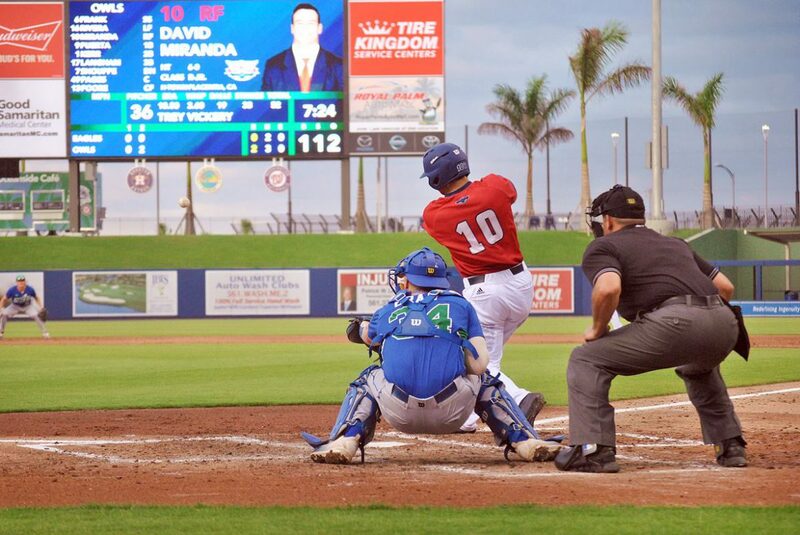 …David Miranda went 3-for-3 and drove in five runs. …Austin Langham went 3-for-5 and scored twice. 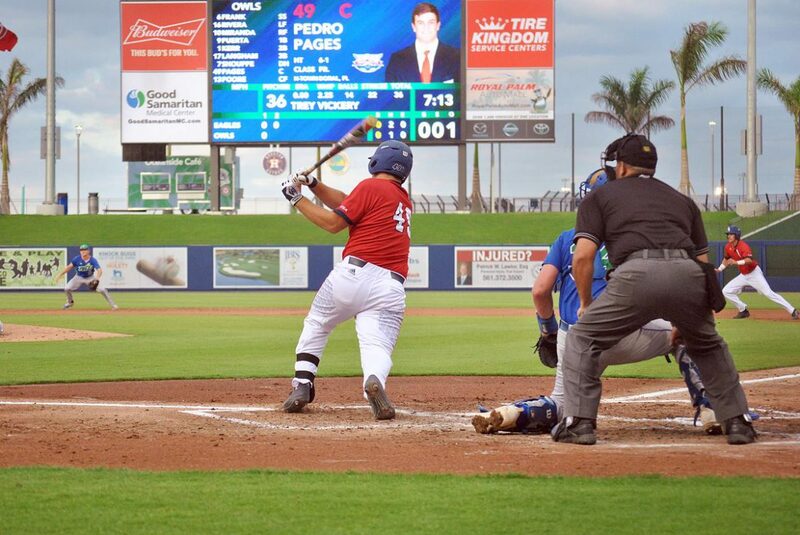 …Pedro Pages also enjoyed a three-hit night, scoring twice and driving in a run. Sliding Backward: Kyle Marman allowed a solo homer and FGCU put two more runners on base before he recorded the final out. …Eric Rivera didn’t get in on the hit parade, going 0-for-4 with a strikeout. Key Stat: 15 – Hits on the night for the Owls, who also didn’t commit an error. 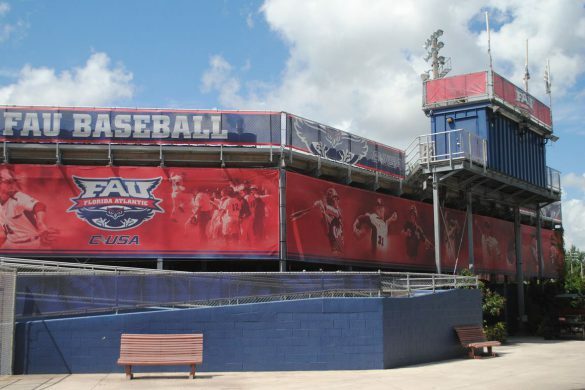 Up Next: FAU returns to its actual home in Boca Raton to meet rival FIU in a weekend series. First pitch on Friday is scheduled for 6:30 p.m.